Abstract: In order to avoid post power syndrome, the elderly who have a hobby of farming / gardening can be empowered through the introduction of LOF (liquid organic fertilizer) making technology and its application. The aim is for the elderly to understand the technology of making organic fertilizers that are lightweight, useful and entertaining as well as for them to feel contribute in maintaining the environment. The training method applied is a combination of interactive lecture and practice methods. Based on these methods, have succeeded in growing their creativity in making LOF and feel comforted on the results obtained. Successful LOF products contained nitrogen, phosphorus and potassium (NPK) of 146,701 mg / L, 0.741 mg / L, and 0.035 mg / L, respectively, and magnesium (Mg) and calcium (Ca) of 86.332 mg / L and 1.970 mg / L. The application of LOF products has been done on the orchid plants (Phalaenopsis amabilis) with satisfactory results. Thus, the mastery of LOF making technology and its application will reduce the dependence of chemical fertilizer use and replace it with homemade organic fertilizer so it can contribute in maintaining health and environmental sustainability. Abstract: According to the Balinese culture, there are some classifications of plants, such as: medicinal plants, ceremonial plants, commodity plants, horticulture, and magical plants. Due to it’ very importance value, culturally, there is a special day for the existing plants, called tumpek uduh, where a special offering is intended to the god of plantation. In this article is drawn function of leaves and fruits as a material for offering. Analysis is focused on the use of fruits as pala gantung, pala bungkah or tuber for the offerings to the god. The leaves are used for religious ceremony in term of panca dhala or asta dala. In composing the offerings, there is a guidance derived from tatwa pangider-ideran (point of compass). The used of leaves and fruits, is based on the color of leaves and fruits. The goals are for preserving/ conserving and peace-full fitting of nature. The liquid of young coconut fruits are used for the process of purifications materials, places, and the symbols of religious matters. Starting from east direction: nyuh bulan, east-south: nyuh rangda, south direction: nyuh udang, south west: nyuh surya, west direction: nyuh kuning, west-north: nyuh be julit, north direction: nyuh mulung, and the middle: nyuh sudamala. That is the respective-, dedicative offerings from human being to the nature by making use of materials for the feacefull, safety, and sustainability of the nature itself. Abstract: Water Irrigation a very important and is one key to the success of the increased production of rice plants in the paddy field. 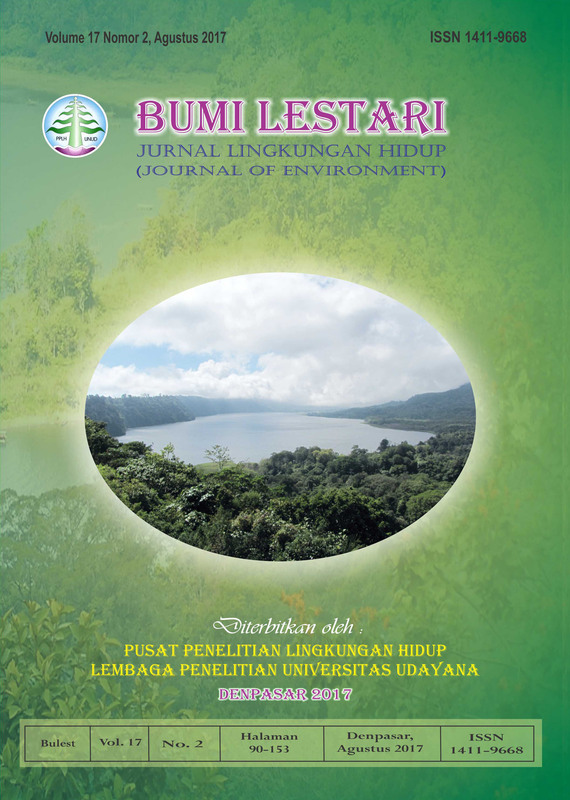 The aim of this study was to assess the water quality Irrigation Dumoga at Kabupaten Bolaang Mongondow Province Sulawesi Utara. Data collected by observation of agriculture activity and determination of sampling by using composite sampling method at canal Irrigation Dumoga. Measurement in situ pH, and temperatur. Analysis concentration total dissolved solid (TDS), total suspended solid (TSS), conductivity (DHL), nitrate and phosphate, sodium, calcium, magnesium in the Laboratory. Method data analysis are Graphic Method and to compare with standart Goverment PP. No. 82/2001 Class IV, and Sodium Absorption Ratio (SAR) Analysis. The results showed that temperatur at canal Irrigation Motabang 29,3 C, pH 7,12, value of the total dissolved solid (TDS) 127 mg/l, total suspended solid (TSS) 7 mg/l, conductivity (DHL) 182 µS/cm, nitrate 0,040 mg/l, phosphate 0,076 mg/l mg/l eligible accordance with the standard PP No. 82/2001 Kelas IV. Natrium concentration 6,38 mg/l, kalsium 0,76 mg/l, magnesium 0,27 mg/l. Abstract: The study concluded that: (1) there is a relationship between people’s knowledge about the behavior of water resources in the use of water r = 0,415 and r = 17,2 %. The higher people’s knowledge about water resources, the use of positive behavior in the water anyway, (2) there is a positive relationship between attitude towards water use behavior in the use of water in the Village District Linggasirna Sariwangi Tasikmalaya district r = 0,396 and r 2 = 15,7%. The more positive attitudes towards the use of water, the use of positive behavior in the water anyway, and (3) there is a relationship between people’s knowledge about water resources and public attitudes towards water use behavior in the use of water r = 0,454 and r 2 2 = 20,6%. The higher people’s knowledge about water resources and increasingly positive attitude toward the use of water, the use of positive behavior in the water anyway.